This photo here of my 11 year old, reading a magazine during his free-time, is a miracle! 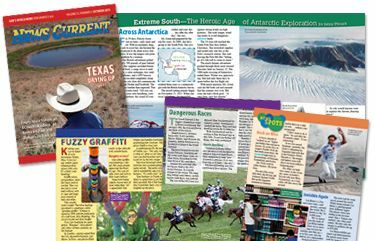 God's World News is a the creator of a Christian news magazine geared toward kids. There are 6 different subscriptions you can get based on the age of your child. They are also from the same publisher as World magazine which has been our family's sole news magazine for over 10 years. I was really excited to learn about the wonderful magazine geared for the kids. They often want to read World, but I have to select articles that will be suited to them, especially the younger ones. Already at a young age they are learning that many magazines and news shows aren't representing the Biblical Worldview. God's World News is a huge blessing, bringing us the news of the world, through Biblical glasses. I was open to review any of the magazines, as I think I have a child in each of the categories! I was excited to review News Current for my 6th grader. As the photo shows above, a miracle really did occur when he got this magazine. This is my 'unreader'. He will do just about anything else before he will pick up a magazine or book to read 'just for fun'. He was drawn in to the article on robots. He read the entire thing, sharing with me information as he went through it. It was a huge blessing to me. He also found an article on airplanes he enjoyed. Each issue includes a nice variety of articles. I didn't get my son to read the entire magazine, some articles didn't appeal to him. What was nice though, in the three magazines we did get, there were a few articles that did appeal to him! That is a huge plus to me. This magazine has been a great resource not only for my 6th grader, but for the other kids in the family as well. I have been able to share some of the world news with them, and it has made it easier to talk about it at their level. All of the older kids have thumbed through the magazine, picking and choosing articles to read as well. A Full year subscription includes 10 magazines each month except for December and May. The subscription costs $28. The price is the same amount for any of the 6 age groups. The September issue comes with a Map that makes it fun for them to locate the different places from the articles. That has been great to really make the distant places feel more real. Included in your subscription is access to the latest website from God's World News. There is a website focused on teens and one for the kids up to that point. You will have access to the online information based on your grade level subscription. I did have access to all of the answer keys for each of the grade levels and the e-version of the magazine. There are some online only articles that I think will be great for upcoming studies. The only thing I wish it had was a search engine for some of these articles. That would make it a bit easier to quickly find interesting bits on current studies of ours. I can download the issue of our magazine and send it to my ereader so we always have it as well. Other members of the team reviewed the subscriptions for various grades. Click on the link below and see what they thought of the product for their school. This is great. Such a positive thing for kids.